In our first two posts in this series on finding the information you need for your visit to Maine, we talked about Maine’s different regions and some of the specifics on the different areas along the Maine coast and in the mountains and lakes. In the next several posts we’ll look at the three icons of Maine tourist attractions: the moose, the lobster and the lighthouse! This post will begin with the moose. 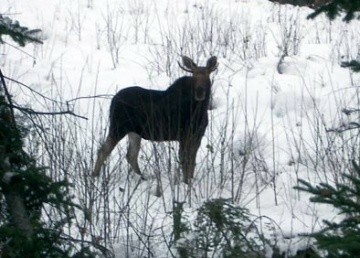 We posted a blog entry about moose in Maine quite some time ago. This will discuss some of the same ideas and add some new ones, as well. Moose in Maine are most common in the western and northern portions of the state, but can be found almost anywhere on occasion. 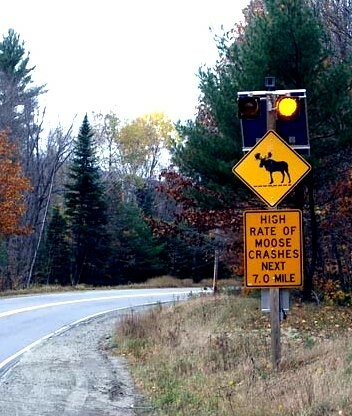 You can choose a variety of ways to see moose in Maine. We’ll talk about several of them. One of the best ways to see moose in the Maine wilds is to take a guided tour. There are many tour operators who offer moose safaris ranging from a few hours to several days. Search “maine moose safari” to see a number of them. These tours will take you into the woods, to get within camera distance of the majestic creatures. They are usually designed for photography, so there will also often be tips on lighting, positioning, and ways to get some really good photos of the giant mammals. If you’re not necessarily interested in a tour, both the Rangeley Lakes region and the Moosehead Lake region are prime locations for finding and watching moose. Both areas have motels, bed and breakfasts, and cabins where you can stay and provide a wealth of information for those looking for a chance to see moose. In addition, if your visit doesn’t allow for a trip of several days to one of the areas where moose are populous, some of these areas are not a difficult day trip from the coastal areas. For example, Rangeley, Maine is only about a two hour drive from Freeport, Maine, so we have driven to Rangely in the afternoon, looked for moose at dusk, and returned to Freeport the same evening. Keep in mind that moose are most often seen at dawn or dusk, as the low light often brings them out of the woods to graze. However, the same low light makes photography a bit of a challenge, and can make for danger along the roads, as you can round a curve or crest a hill to find a moose in the roadway. They are huge creatures, so drive cautiously, as they can do a lot of damage to a vehicle in a collision! However you decide to search for Maine moose, we hope you’ll find them and have a richly rewarding time in Maine!